This year, I think we’ve gotten a record number of phone calls from people who are concerned about butterflies they’ve seen near their homes or have raised in their gardens. It’s no wonder that butterflies are very popular around here and no one wants to see them perish in the not-so-toasty temperatures outside! It may seem silly to some, but I can certainly sympathize. I spend a great deal of my time raising insects and I certainly get attached and would do things to care for them that might make some question my sanity! 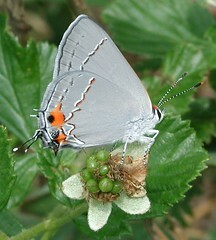 However, butterflies and other insects have been surviving through the winter for millions of years. Butterflies native to Houston have definitely got the climate figured out by now! So, before you go darting across your lawn after that poor butterfly, there are some things you should know! As I pointed out in my post, “Where Have all the Bugs Gone?” bugs, including butterflies, are not quite as sensitive as many believe. These small but resourceful beings have quite a few tricks up their sleeves! Over-wintering, hibernation, migration, hunkering down; these are just a few examples. Butterflies in Houston pretty much have it made. Especially when you consider the fact that there are butterflies in the North, like the Morning Cloak, that can survive through a truly frigid winter and emerge in the spring better than ever! Our winter is very mild comparatively, with plenty of warm, sunny days. Here are some common Houston butterflies and how they survive the winter. Swallowtails (giant swallowtail, black swallowtail, spicebush swallowtail, and more) – These butterflies spend the winter in a suspended state called diapause and they spend it as a chrysalis. They are immobile, take in no food or water, and are extremely resilient. They can certainly hadle the very few freezes we experience here in Houston. I have had swallowtail chrysalids that have not emerged for nearly a year and a very healthy butterfly was the result! 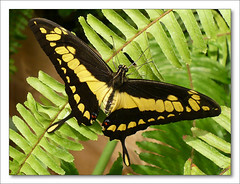 Longwings – The gulf frittilary is our resident longwing. This is another butterfly that can be seen year-round in any of the four life stages. The mobile stages such as the larvae and adult will hunker down to avoid freezing temps. The immobile stages, the egg and pupa, are more resistant to temperature. Sulphurs – These sunny yellow butterflies can be found all over the world, including above the Arctic Circle – how’s that for cold! Favorites like the cloudless sulphur are found throughout the entire year as adults, even during the winter. When the temperatures drop too low, they hide in crevices in trees or man-made shelters and they fly when it is warm, gathering food to continue to carry them through the winter. Monarchs – These are the most popular of all! 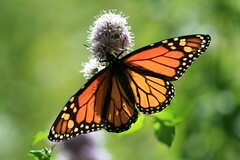 Monarchs are known for their incredible migration from as far north as Canada, down to the mountains of Central Mexico. These butterflies, unlike some others, cannot withstand the freezing temperatures of the North. They do not only go to Mexico, some find their winter homes in California, Peninsular Florida and the Keys, and even here. We have a population that does not migrate from Houston because the temperatures are warm enough. If you see a Monarch outside during this time, don’t worry, they haven’t missed the boat, they are quite happy here! So you see, we do not need to intervene – butterflies know what to do when it gets cold. The temperatures outside right now are not deadly, just uncomfortable. Insects can go a long time without food or water and as soon as the sun re-appears, they will get their fill. If it does freeze, they will seek shelter. Now, if you have been raising monarchs or other butterflies in your garden and you bring them inside to be warm, there is a chance they will emerge as adults when it is way to chilly for them to be released. They cannot be kept alive inside your home either. In this case, we will happily allow you to release them into our conservatory where they will be quite happy! Some butterflies will indeed perish during these few cold months, but it’s all part of the cycle that has been going since the creation of Earth and we should try not to intervene to much! Until next time, Happy Butterfly Watching! Hi Janice! I love cloudless sulphurs, they are so beautiful and I can imagine it was not a pleasant site to see them frozen in that way! These butterflies do migrate to the south during the late summer and fall. Since you live in Tennesee, the butterflies may be from the north, or native to your area. They probably do not migrate from TN, and certainly not in the middle of the winter. Cloudless sulphurs, like many butterflies, will roost together, especially males. In large numbers, they have a greater chance of attracting a female. The butterflies in your yard were probably trying to seek shelter in the bush, but the extremely cold temps must have gotten to them anyway. Cloudless sulphurs overwinter as adults and thet’re are much more tolerant to cold than other butterflies. Sometimes they may seem frozen and dead, but when they thaw and warm up, they will come back to life. If they are still there, you might try getting them somewhere warm and see if you can revive them! The hard freeze may have been to much for them, but it’s worth a try! Thanks for reading!